Order by 1:00pm for same day local delivery. We can also arrange delivery nationwide. 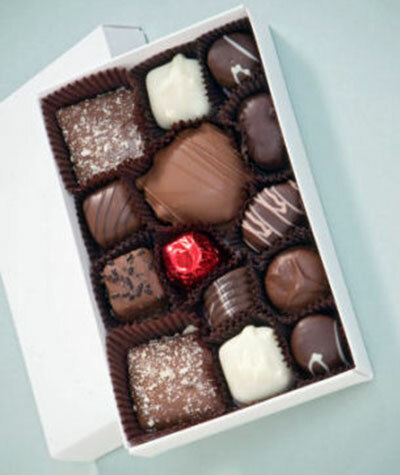 1/2lb assortment of your chocolate favorites in a white gift box. From Roberta's Chocolates in Denver, CO.
Substitutions may be necessary to ensure your arrangement or plant is delivered in a timely manner. The utmost care and attention is given to your order to ensure that it is as similar as possible to the requested item. Flowers are a function of nature. Sometimes, specific flowers and specific colors just aren't available on a given day. In arrangements of assorted flowers, the colors shown online will be used if at all possible, even if this means substituting other kinds of flowers of equal or greater value. For green and blooming plants, similar plants may be substituted of equal or greater value. For one-of-a-kind plants, such as orchids, we will make every attempt to match the plant type, but may substitute with another color. Copyright Castle Rock Florist. All Rights Reserved.